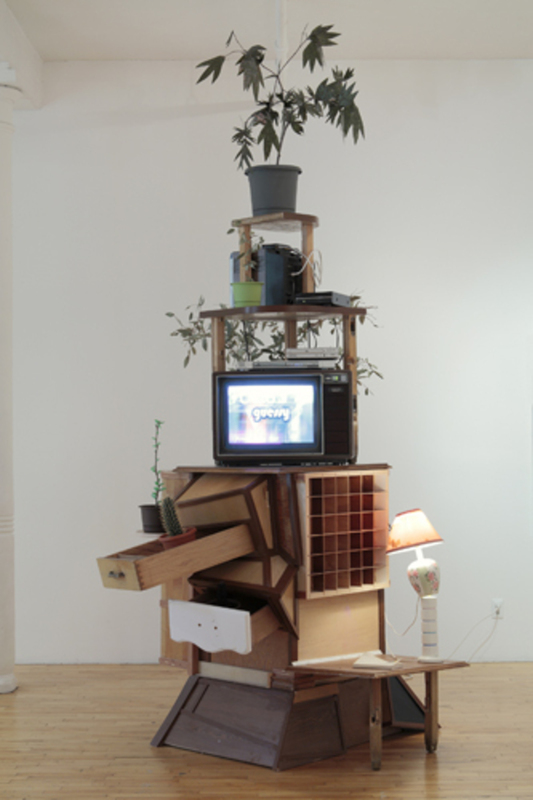 David Snyder, Medium Power, 2011, wood, books, lamp, monitors, CD player, DVD players, mixed media, plants, 53 x 24 x 22”. “We’ll call it your safe place. Can you see it now?” The city inhabited by the eight artists in this show is far from the tranquil refuge suggested by a therapist in Dan Finsel’s video Shameless Secrets from My Past, 2009. Los Angeles in 2011 is many things to many people, but “safe” rarely tops the list. In fact, on the evidence of this selection in general and this work in particular, it’s as edgy as ever. So while Finsel takes a performative tack in exploring his own emotional makeup and leaves us with an impression of profound existential confusion, Alex Klein applies a more outwardly controlled and stylish aesthetic, riffing off the construction of identity in pop music through pose and gesture in her video Person to Person, 2010. David Snyder’s Medium Power, 2011, a teetering pile of modified furniture stuffed with houseplants, collaged books, and audiovisual gear, steers a crooked path between the introspective approach and a survey of culture at large; incorporated into it is a video that parodies, with anarchic glee, a parade of commercial TV staples. Gentler are paintings by Miller Updegraff and Sanya Kantarovsky. In the former’s works, figures are rendered in a misty indigo and sprinkled with glitter, adding a layer of quasi-mystical atmosphere to their already enigmatic status. In the latter, a seemingly more casual approach to the image is revealed as a sophisticated game of mix and match with visual cues derived from a cadre of political and artistic moments. “3,348 Hours of Sunshine” may have its quieter moments, but—mellow title notwithstanding—it never quite allows us to relax.